Remember the good old retro RP games of the ’90s? If you remember, we have two news, one good, and one bad: The bad one is, yes, you’re old. The good one is that you can relive the days of old with Knights of Pen & Paper 2! This 16-bit RP game will offer you hours of adventures and lots of things to explore. But before we start doing those, we need to install the game and configure it on BlueStacks. 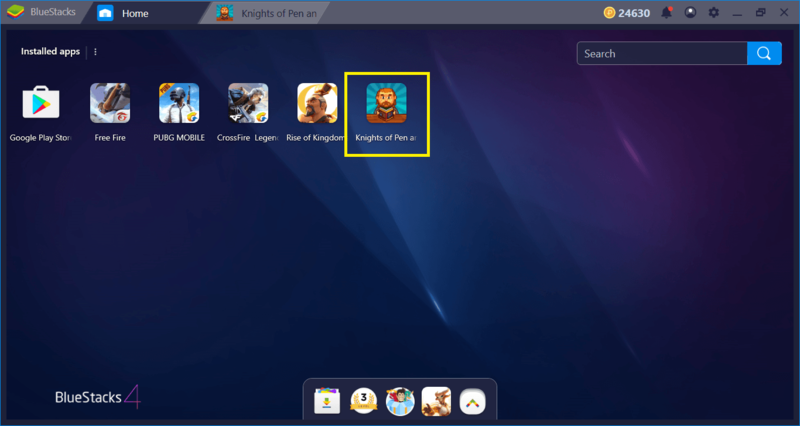 Moreover, we need to learn how we can use the unique features of BlueStacks to our advantage. Well, worry no more adventurer: We will tell you how to do all of these. As always, we start by searching for the game on BlueStacks App Center. To do that, write the name of the game in the search box while the main interface is open and press “Enter”. 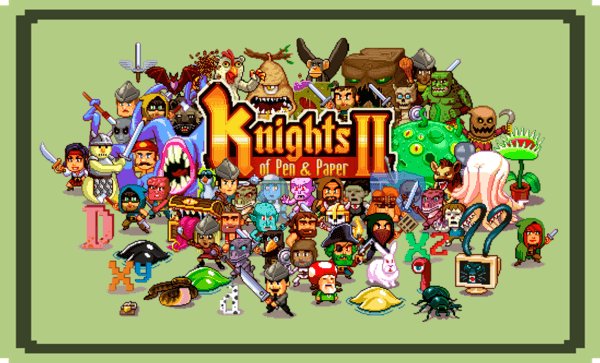 Find “Knights of Pen & Paper 2” in the search results and press the “Install” button this time. The game is only 75 MB big, so this download won’t take long. In a couple of minutes, you can start playing the game by clicking on its icon on the main interface. You don’t need to download gigabytes of data, hooray! To start your adventure, click on this icon. 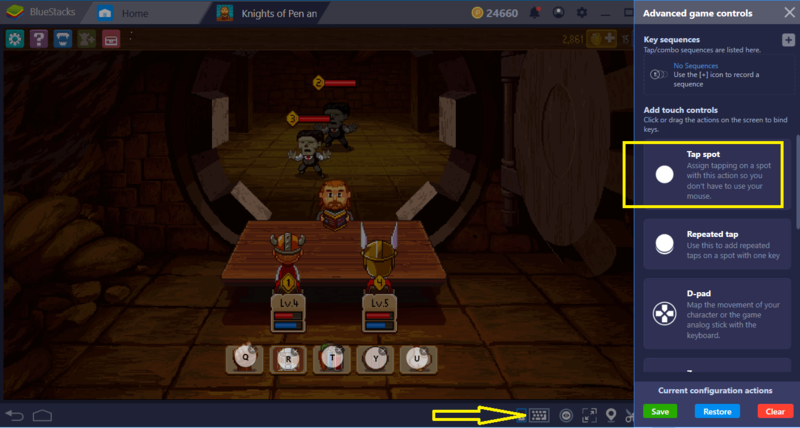 Knights of Pen & Paper 2 is a game that can be played only with your mouse from start to finish. 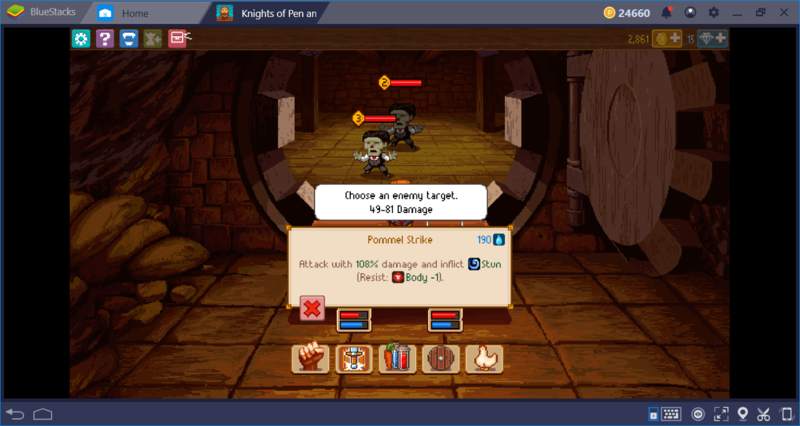 The interface is designed for this: You can activate all features in the game with mouse clicks. So, by default, BlueStacks does not offer keyboard keys in its control scheme. However, this does not mean that you cannot add them – if needed, you can still assign a keyboard key to every function with our unique “tap spot” feature. To start, click on the tiny keyboard icon at the bottom right. To simply explain the image above, we dragged a “tap spot” to locations which we normally “click”. You can assign any number of tap spots and place them anywhere on the screen. Just don’t forget to assign a key to each of them. In the future, you can activate those features by pressing the assigned keys instead of clicking. 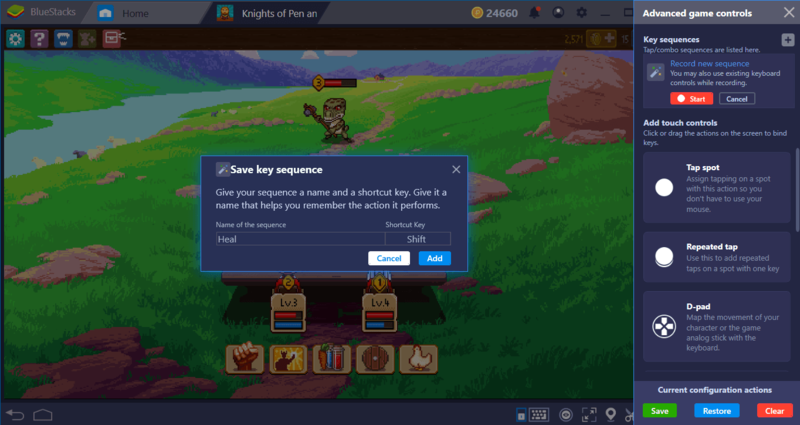 As you know, our Combo Key feature lets you record a series of actions and repeat all of them with a single key press. 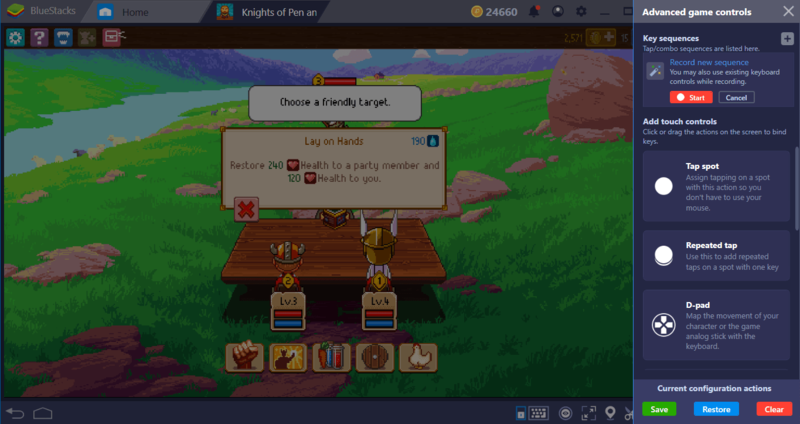 This feature will be particularly useful in Knights of Pen & Paper 2, because as we mentioned in our review, the battles are quite hard and you need all the help you can get. During the fights, you can use potions and special abilities when it is your turn. If you have a healer in your party –and you should- the healing ability of that hero will be used more than once during fights. You need to make at least three clicks for that: With Combo Key, we will lower these clicks to one. Start the recording and use your ability. Note that you can add multiple abilities to this recording and add potions too, for example. We are done with the action – now, we give it a name and assign a key. In future, all we need to do to repeat this recorded action is to press the assigned key. Save time so you can save the world faster. We are ready to face the dangers in this world: Let’s start playing. But before starting your journey, we recommend taking a look at our Tips & Tricks guide too, as it contains useful info. 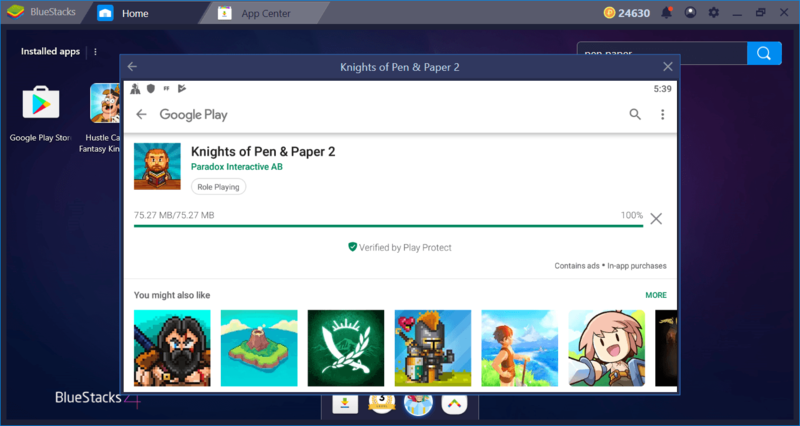 Whether you are an old-timer or new to RP games, Knights of Pen & Paper 2 offers lots of fun and amazing adventures: Let’s explore this world on BlueStacks together!